The upper back can start to round over as we get older. It can actually start in the teen years! Yap! You little Text Addicts you! I see those young people on the streets of NYC with their heads down looking at their phones! That is where it starts. Little No heads! Doctors are going to be so busy caring for “Text Neck”. I see Twenty Year Olds, Thirty Year Olds, Forty year olds and yes us 50-year-old folk whom are using our phones a lot too. I catch myself, an alignment trainer, mind you, looking down at my phone and sure enough my chin is resting on my breasts! Not kidding! I keep it quiet! I quickly put my cell phone up above my nose, hand out stretched and I say “Phone, Phone Phone in my hand who has the best Posture in the land?” Those seeing this, think I am a “Houtie Toutie” princess! Which I am, so NOT! But I must save my neck, save my chest and of course my posture! So where am I going with all this? As an alignment trainer for 28 years, when I see bad posture, I get “Bent Out of Shape”! I thought on the 7th day of 365 days, I would give you guys a killer Ab Exercise that would Rock your Abs Hard. 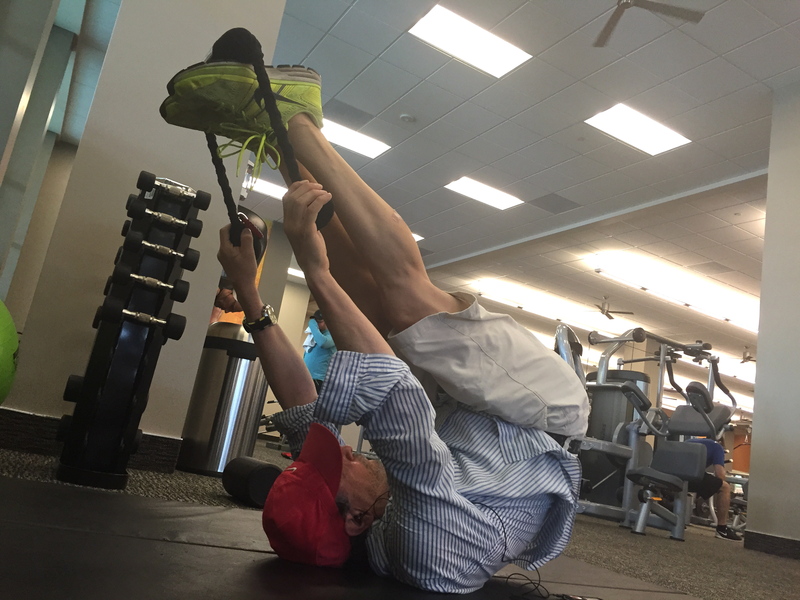 First, to see someone my age do a sick hard Ab exercise, is well, weird. But NOT this day. No, what happened was I was walking from one room to another in our home and I saw my Dad in a state of kissing the table with the worst posture I have ever seen. I mean it almost looked like he keeled over. Well not quite, but I have seen that when he falls asleep at the table. I was the former trainer to Dr. Henry Kissinger for eleven years. Similar to my Dad, in a good way, stubborn, smart and very, very interesting. I am not sure, but I think all my years as a specialized alignment trainer are coming to volition. Helping my Dad stay up right is personal “Training For Life”, My old Tag Line for Aline Fitness, in 1989! I worked hard to get here! This segment is about keeping the chest up, our chin up and getting a natural lift in our life. In doing this exercise you can improve your posture at work, at school, in a train, plane or like my Dad, playing a word game! You do NOT need to be 88 to figure that out! When the chest is up and your shoulders are down, you are lifted and strutting the town, you look younger, feel younger and you look confident and on your game. This day, day #7 is for everyone, NOT just for the older folks. My Dad is NOT a texter, he is a Crossword Puzzle Addict! It is very serious too. His head is really down, down, very down and looking at that paper most of the day. When I saw that terrible posture, I had to interrupt his moment with the “words” and give him some “words” of my own! Dad, Chest Up! The video tells the whole story of our first session together! Get A RollerSizeR and Join In! $39.95! Free Shipping! Categories: Range of Motion, Stress & Stretch | Tags: ab workout, fat loss, portable ab tool, posture, rollersizer, stress, stretch | Permalink.